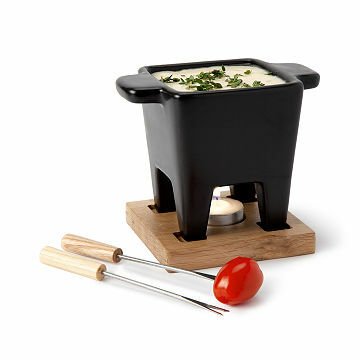 Feed great conversation with morsels of savory fondue from a handsome pot made for entertaining a party of two. Whether you're getting girls' night off on the right bite, or nibbling your way through a romantic night at home, this sleek set is designed to bring the best out of one-on-one time. A square ceramic dish optimized for swift melting fresh cubes of cheese with tasty extras like salsa, curry or mustard, warms your ingredients into a decadent in minutes. Simply light the included candle to swirl your cheese or chocolate fondue to taste. Fondue For Two ceramic pot holds roughly a cup and half (14 oz.). Also ideal for serving warm sauces. Pot set on a sturdy, mahogany wood board. Microwavable up to two minutes. Made in China. Includes tea light candle and two serving prongs. Hand wash board. Pot is dishwasher safe and microwavable up to 2 minutes. I wish I had bought two..
Couldn't have asked for a better gift, thanks! Very small for the price! Fondue for two should really read fondue for one. Will service well as a warm dip container at small parties.